Blade Runner 2049’s vision of the future is stark. The grim LA landscape is ravaged by climate change, San Diego is piled high with trash, and ‘digis’ - computer-generated entities – now exist alongside humans and replicants. The future is an irresistible playground for film-makers and authors, and this dark fantasy is not meant to be a prediction. I’m not sure what 2049 has in store, except that, by 2050, it's predicted that 66% of the population will live in urban areas. Larger cities will create a new set of transportation, sanitation, and infrastructure needs, and will change the market dynamics for companies in a wide variety of industries. As cities grow in size and importance to the global economy, it will be increasingly important that they adopt forward-thinking design and sustainability ideas. New technologies, processes, products, and engineering solutions will be needed to address the issues arising from the unprecedented rate and scale of urbanisation. In the next decade, the common objectives in cities will be to improve quality of life and the health of the wider environment. With these goals in mind, they will become increasingly interconnected, smart environments, designed to enable people, government and business to interact more effectively with one another. The infrastructure of smart cities will depend on three major technologies – big data, the IoT and renewable energy – working in synergy to make everyday living better. Wireless connectivity will be the glue that holds everything together, helped by continuing advancements in artificial intelligence, robots, drones, autonomous vehicles, 3D and 4D printing, and renewable energy. Data will create awareness of problems, such as traffic jams, and will enable cities to decide how to make the best use of their resources, including space, fuel, energy, water and electricity. Clear priorities will include: monitoring the environment to anticipate potential threats from earthquakes, hurricanes and other natural disasters; effective waste reduction; and the provision of smart roads, with facility for autonomous vehicles and battery-charging stations for electric vehicles. Logistical decisions within cities will be informed by massive amounts of data captured about the population and its behaviour. An ever-expanding IoT, encompassing traffic lights and cameras, pollution sensors, building control systems, and personal devices – will feed giant data stores in the cloud. With a growing resource of devices algorithms, AI, and predictive software, this data will be crunched and acted upon with greater speed and efficiency. Here’s the bit that really does sound like science fiction – cities are destined to become more like living organisms as they become smarter and more interlinked. Rapid growth of the IoT is expected over the coming years, with 28 billion connected devices predicted by 2021. Further expansion of the IoT means that, potentially, everything – and everyone – could become beacons and data collection devices. Smart cities will effectively have a “brain”, which soaks up intelligence from a range of technologies and uses it to understand the behaviour of the urban crowd. Drawing on this insight, a city can make decisions on how to control pollution, monitor traffic, allocate parking and communicate with citizens. It may even try to steer city dwellers’ behaviour – for instance, by rewarding drivers for using recommended routes. On a very personal level smart cities and data must start infiltrating people’s lives at a grass roots level. The medical profession is already slowly driving resources towards becoming more efficient with the use of mobile technology in and out of hospital. Systems are beginning to be put in place to allow doctors to monitor patients at home, with the use of smart technology. With the rapid development of data around smart cities, this remote monitoring will only increase. For example, doctors could monitor their patient’s progress remotely, and link to related 999 calls. Smart city data can then be used to clear a route to deliver the patient to a hospital quickly and efficiently. It’s not possible yet but the data can be made available. Education and schooling could too benefit from smarter city development with teachers and students increasingly acting remotely. This is already happening with interactive classrooms and homework placed online but how about disrupting issues within schools. What if the school meals served could be rated by students, allowing the institutions to change their delivery process? How would this affect what food was ordered, how it was delivered and even who supplied it? Maybe it could reduce waste, streamline services and save the environment in one fell swoop. I’m confident that the smart city of 2027 will transform the organisation of people and physical objects in a positive way. Contrary to the film-noir interpretation of the future, sustainability will be at the heart of urban development. Cities will be more efficient, and nicer places to be, when there is greater harmonisation of people and the urban landscapes where they live and work. My only disclaimer is this: although technology is moving at a rapid pace, smart cities take time to develop, they cost a lot of money, and they require a commitment from government to make them happen. 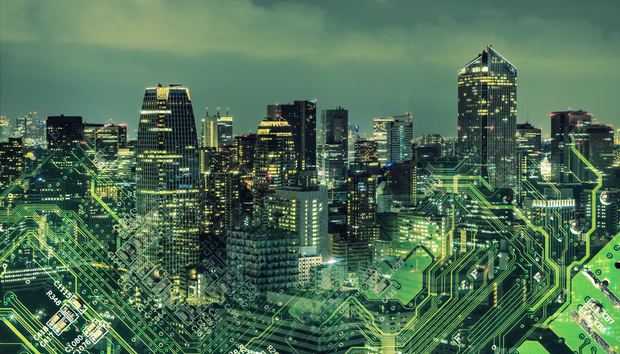 By 2025, it’s predicted that there will be 88 smart cities, out of around 4.5k cities globally. Though the benefits of bringing cities up to “smart” status far outweigh the costs, the next decade of development will depend on the will and investment of decision-makers and stakeholders.